Why You'll Never Really Get Over Jim And Pam From The "The Office"
The Office romance that gave you faith in true love and sassy side glances. As soon as The Office entered our lives, we knew Jim and Pam were meant to be. The Dunder Mifflin flirting was so perfect. Jim was obviously infatuated and Pam had no idea. But we all knew she would fall for him eventually. But Finance Roy in the way of their love. It was a pretty uncomfortable time for all involved. Because she was engaged, their relationship stayed platonic and the best friendship grew. But Jim couldn't get over her, and we couldn't get over them. When Roy announces the wedding date, Jim is crushed and realizes he is losing his chance. But despite the adversity, Jim can't help but flirt with Pam and we loved every moment. HOW could you be making this decision Pam??!?! Pam kept thinking she was not into Jim. And then Jim finally told her how he felt. And we all fell down and died. When they kissed for the first time, we jumped for joy. Then Pam just turned him down again, but she did end her engagement to Roy, so that was good. And to crush us further, Jim transferred away from Pam to a different office. And then Jim started dating Karen and we all gave up hope. Which obviously made it a better pay off in the end because we always knew Karen was just a rebound. 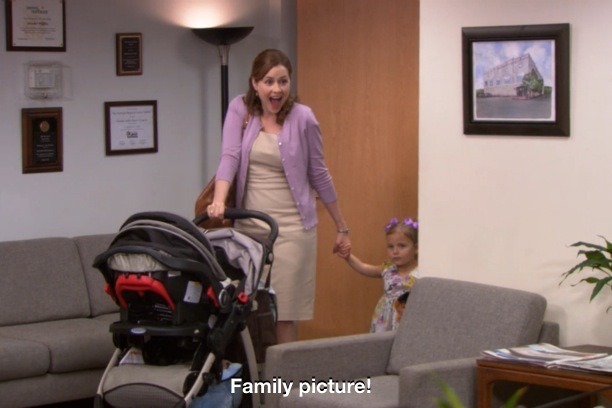 We all cried with Pam when she realized she lost Jim. Seeing the good in what you have before it is gone is one of the hardest things in the world and we all shared Pam's regrets. And this was the hardest to watch. Until Jim finally asked Pam out, and she finally said yes. And WOW are they not the sweetest couple ever? How will the most meant to be real life couple survive a real life problem? Jim's new job > family? But then Jim comes to his senses!! !